How I got this book: Random House sent me this book for review. Why I read this book: A free copy was offered to TBTB for review and I claimed it! 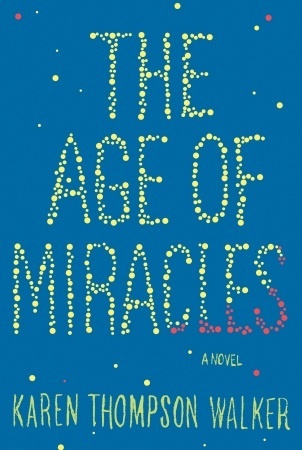 The Age of Miracles tells the story of twelve-year-old Julia, who wakes up one morning to discover—along with the rest of the world—that the Earth’s rotation has begun to slow. As both the days and nights grow longer, the gravity and the weather are not the only things to be affected: Julia must also deal with the societal implications as well as the effects on her own family and friends. I really wanted to like this book. I love science fiction, and the plot sounded incredibly creative. I also love a good bildungsroman, and from the description I got from Random House as well as the book flap, it seemed like it would be a great story about growing up in a crumbling world. Unfortunately, it seemed a bit to me like Walker tried too hard to make it both without putting enough substance in the story. It just seemed to me like there were far too many loose ends. Early on, eleven-year-old Julia is sexually harassed at the bus stop by an older boy—and nothing at all comes of this, other than the fact that she loses a beloved necklace that is mentioned maybe one or two more times. Later, Julia’s friendship with her best friend Hanna collapses unexpectedly, with no resolution. I realize that this can happen to relationships, but it felt like it happened for no reason. After Julia turns twelve, she is invited to a small party in one of the wealthier neighborhoods, where she and a few other young teenagers drink beer—and again, nothing at all comes from it. Frankly, it seemed less like an actual plot than a series of random events, loosely strung together against the backdrop of the inexorable slowing of the Earth’s rotation. I was also hoping to see some more of Julia’s actual growing up, but the only birthday she passes in the entire book is her twelfth. She’s much older in the last chapter/epilogue (at least 23), but most of the blanks between her twelfth year and her twenty-third are left unfilled. I think the story would have flowed a little better if it had taken place over more than a year. I’m the type of person who likes long books that I can lose myself in—books where I can really get to know the characters and get involved in the story. At only 269 pages, this was not one of those books. It felt rushed and disorganized to me, despite the very promising plot, and I think that if she had explored some of the incidents I mentioned above a bit more, she could have written a much better, more coherent story. That's too bad this book didn't work for you. I really enjoyed this one. I thought Karen really had a way with words. And I think she was trying to make a point about how life goes on, not really changing, even in the wake of the end of the world. Hopefully you enjoy your next book more. I'm glad that you too didn't love it- I think the premise had a lot of promise (and I'm sure will do great as a movie one day) but I thought the characters were a bit flat. It wasn't bad, just not worth the hype of the amount of the publishers bought it for! I loved this book. I am sorry you didn't. This is one of the books where if you go in looking for a concrete plot you aren't going to find it here. It was more about the writing and the feelings. But I love books like this and they aren't for everybody. :) Great review. I have this on hold at the library and was hoping it would be good. I love the idea of the story because it reminds me of my favourite episode of "Aftermath" (if the world stopped spinning). I will give it a go and if I don't like it at least I didn't buy it! I actually loved this book and gave it 5 stars! I think that Julia's situation with bullying at the bus stop was VERY realistic. She didn't tell an adult that she was bullied, which is why nothing happened. It's a very normal situation for students and bullies. It's also realistic for her friendship to collapse on a whim. That happens allllllll the time with young girls. They turn on each other unexpectedly, and in a case of Earth being possibly doomed, it makes sense that they might turn on another other without a reason. I lost myself in the book and thought that it was a good wrap-up in the ending, so I completely disagree with your review. What I had meant about "nothing" happening not only that she didn't tell a teacher and no one was punished, but that she also wasn't really bullied much at all past that. The way it was introduced made it seem like the bully (whose name I can't remember at the moment) was going to be a central antagonist, but he wasn't.